The folks at Crankbrothers have been busy. 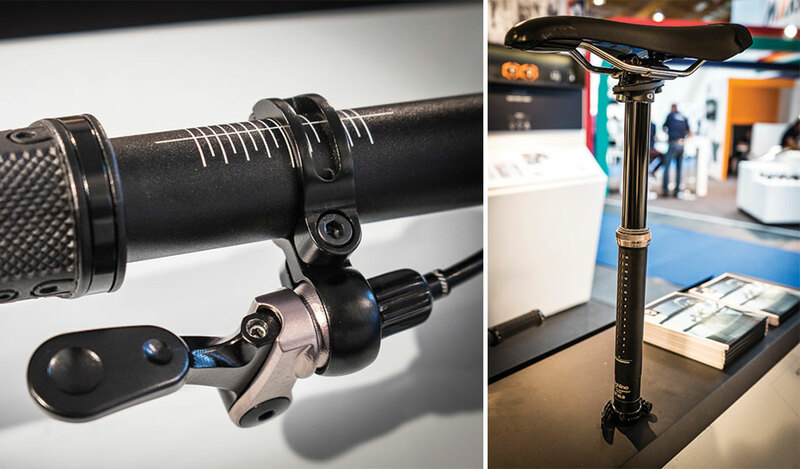 This year at Eurobike they’re showing a brand-new dropper post called the ‘Highline’ as well as an overhauled pedal lineup. Keep reading for details on all the new bits. Based off what we saw on the expo floor, the Crankbrothers Highline looks to be a solid new entry to the dropper-post market. Having learned from the issues they ran into with their previous post, the Kronolog, the folks at Crankbrothers approached the design and testing process with the intention of bringing the post to market only once they were 100 percent sure that they could stand behind it. And they’re putting their money where their mouth is by backing the Highline with a 3-year warranty. The cable-actuated post features an easily swapped, fully-contained hydraulic cartridge, which Crankbrothers claims has been tested for up to 40,000 cycles. The post features 125 millimeters of drop and routes internally. There is no externally routed version. The quick-connect mechanism at the interface of the cable and the post allows it to be easily removed and reinstalled. There are plenty of dropper posts on the market these days, but only a few have really nailed the remote both ergonomically and functionally. The Highline looks like it might join those elite ranks. It can mount anywhere you want on the bar–left or right, below or on top–and the spherical interface between the lever and the single-bolt hinge clamp allows for 360 degrees of rotation and 22 degrees of tilt adjustment. 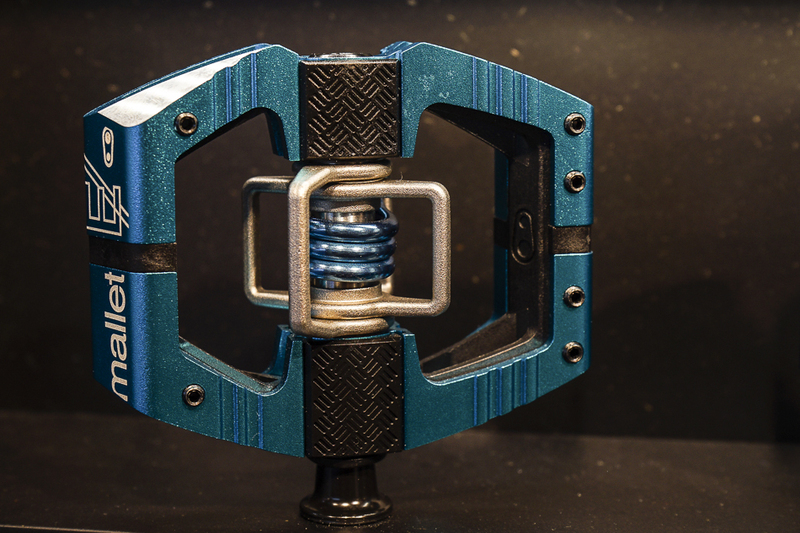 Crankbrothers updated the internal components on it’s entire range of pedals with an eye towards durability and performance. The key update is to the bearing system. Every pedal in the range will now spin on an outboard Enduro cartridge bearing, which is specifically designed for the low speed, high torque forces experienced during pedaling. Inboard, there’s an Ignus LL-glide bearing, which was produced exclusively for Crankbrothers. The new internals are protected from the elements by a new double-lip internal seal and a redesigned external seal. The double-lip seal is essentially a seal with a trough in between the outer edges, which catches contaminants and makes for two seal points instead of one. You’ll also notice that the pedals have small black pads on either side of the engagement mechanism. The new pedals will come with both one- and two-millimeter pads which can be swapped out to fine-tune the shoe/pedal interface. Using the two-millimeter pad can also compensate for a worn outsole, potentially lengthening the life of your shoes. The new Mallet E is a trimmed-down version of the popular Mallet DH. The Mallet DH has become a favorite amongst aggressive riders, so Crankbrothers tweaked the design to create a bit of a lighter, more compact package for all-mountain riding and enduro racing. The result was the Mallet E, which is 12% smaller and 50 grams lighter than the DH version. It also has a narrower Q-factor and a ribbed body for traction in those desperate unclipped moments. Additionally, there’s a new Candy pedal with the integrated traction pads and a slightly tweaked body shape from the original body. The both the Mallet E and the new Candy 7 will retail for $165. There’s also a titanium version of the Candy, the Candy 11, which will retail for a wallet-gouging $450. 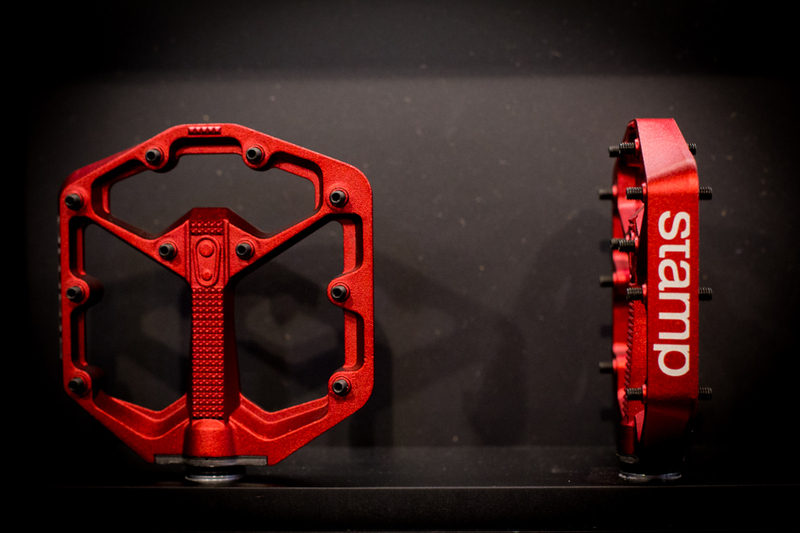 Finally, Crankbrothers showed us their new Stamp flat pedal. It comes with all the accoutrement of a modern flat pedal: a thin profile (it’s only 13 millimeters tall at its tallest point), adjustable pins and a concave shape. But Crankbrothers takes it a step farther with two separate sizes optimized to maximize the surface area available on the industry’s most popular flat pedal shoes. The small Stamp is intended to be used with shoes in the US 5-10 range, while the large is for sizes 10-15.